PARKTOWN – The Charlotte Maxeke Johannesburg Hospital School receives R800 000 in renovations. 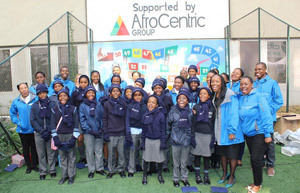 Pupils at the Charlotte Maxeke Johannesburg Hospital are excited for their winter accessories from Afrocentric Health. Charlotte Maxeke Johannesburg Hospital School received a helping hand from Afrocentric Health to give their school a facelift. Afrocentric Health has worked hard to renovate the classes in the school and to ensure that more than 100 learners who have been hospitalised for a long time at Charlotte Maxeke, continue to receive their education. Afrocentric Health has refurbished sections of the hospital with custom-made classrooms, upgraded a computer-lab and renovated a custom-designed playground. They donated 13 laptops for the teachers, 13 desktops for the computer classroom, they painted the classrooms, provided furniture suitable for children with special needs, new playground equipment including wheelchair-friendly equipment and they will be providing IT support for the donated hardware. The new renovations have cost the company R800 000 and over R2 million since the beginning of the partnership. “The renovations are in furtherance of Afrocentric Health’s belief that children are our future and that each child deserves the opportunity and support to achieve his or her best,” said Dr Anna Mokgokong, chairperson of Afrocentric Health. The school principal Ronel van Biljon said that they are very excited of the new changes, “Our children are all excited and we are all very grateful of the opportunities Afrocentric has presented to us in the past years,” said Van Biljon.